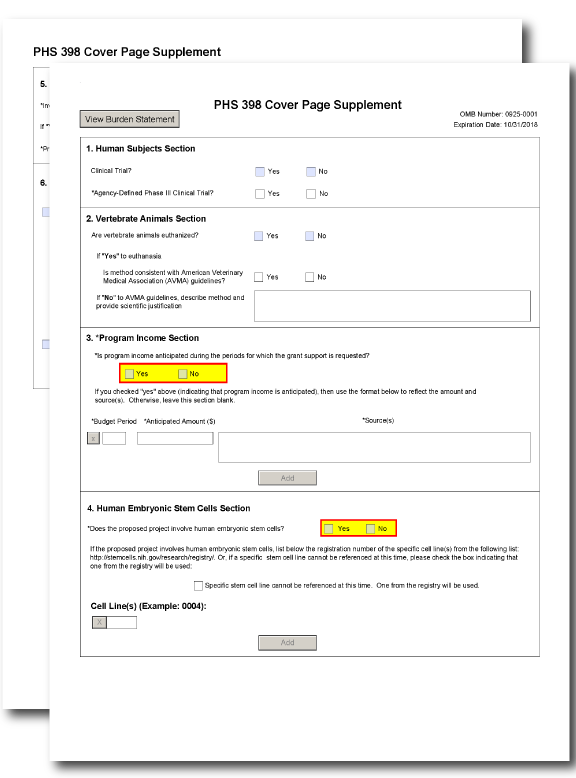 The PHS 398 Cover Page Supplement Form is used for all grant applications except fellowships. This form collects information on human subjects, vertebrate animals, program income, human embryonic stem cells, inventions and patents, and changes of investigator/change of institution. An answer to this question is required if you answered "Yes" to the question "Are human subjects involved?" on the G.220 - R&R Other Project Information Form. Check "Yes" or "No" to indicate whether the project includes a clinical trial. See NIH Glossary for the definition of clinical trials. Overall Component: If a clinical trial is included on any component, then the answer to "Clinical Trial?" must be "Yes." Agency-Defined Phase III Clinical Trial? An answer to this question is required if you answered "Yes" to the "Clinical Trial?" question above. Check "Yes" or "No" to indicate whether the project is or includes an NIH-defined Phase III clinical trial. See NIH Glossary for the definition of Phase III clinical trial. If you checked "Yes" to "Are human subjects involved?" on the G.220 - R&R Other Project Information Form and "Yes" to "Clinical Trial?" on the G.210 - PHS 398. Cover Page Supplement Form, you must answer the "Agency-Defined Phase III Clinical Trials?" question. Check either "Yes" or "No" to indicate whether plans include or potentially include trainee participation in projects that are NIH-Defined Phase III clinical trials. Overall Component: If an agency-defined Phase III clinical trial is included on any Component, then you must answer "Yes" to the "Agency Defined Phase III Clinical Trial?" question. You must answer this question if you answered "Yes" to the question "Are Vertebrate Animals Used?" on the G.220 - R&R Other Project Information Form. Check "Yes" or "No" to indicate whether vertebrate animals in the project are euthanized. Overall Component: If vertebrate animals will be euthanized in any Component, then you must answer "Yes" to the "Are vertebrate animals euthanized?" question. If "Yes" to euthanasia: Is method consistent with American Veterinary Medical Association (AVMA) guidelines? You must answer this question if you answered "Yes" to the "Are vertebrate animals euthanized?" question above. Check "Yes" or "No" to indicate whether the method of euthanasia is consistent with the AVMA Guidelines for the Euthanasia of Animals. For more information: See AVMA Guidelines for the Euthanasia of Animals. If you answered "No" to the "Is method consistent with AVMA guidelines?" question, you must describe (in 1000 characters or fewer) the method of euthanasia and provide a scientific justification for its use. This justification will be reviewed by Office of Laboratory Animal Welfare (OLAW). If you answered "Yes" to the "Is method consistent with AVMA guidelines" question, skip this question. Is program income anticipated during the periods for which the grant support is requested? If program income is anticipated during the periods for which grant support is requested, check "Yes," and complete the rest of the "3. Program Income" section. If no program income is anticipated, check "No" and skip the rest of the "3. Program Income" section. Check "No" for the "Is program income anticipated during the periods for which the grant support is requested?" question. Instructions have changed so that program income information is no longer collected at the Overall Component in multi-project applications. Overall Component: If you anticipate program income on any component, then answer "Yes." Skip the other fields, as any information provided in them will be discarded. Instead of program income information being provided in the Overall Component, a system-generated summary of all program income information that you provide in Other Components will be included in the summaries section of the assembled application image. Other Component: If you anticipate program income on any component, then answer "Yes." Provide the budget period, anticipated amount, and source information. Enter the budget periods for which program income is anticipated. If the application is funded, the Notice of Grant Award will provide specific instructions regarding the use of such income. Enter the amount of anticipated program income for each budget period listed. Enter the source of anticipated program income for each budget period listed. Use the following instructions to complete the fields in this section. For additional guidance, see the NIH Guide Notice on the Change in Requirements for NIH Applications Involving Human Embryonic Stem Cells. Does the proposed project involve human embryonic stem cells? If the proposed project involves human embryonic stem cells (hESC), check "Yes" and complete the rest of the "4. Human Embryonic Stem Cells" section. If the proposed project does not involve hESC, check "No" and skip the rest of the "4. Human Embryonic Stem Cells" section. Check "Yes" if training plans include or potentially will include involvement of trainees in projects that include hESC. Note that trainees may only conduct research with hESC lines that are approved for use in NIH-funded research; these cell lines are listed on the NIH hESC Registry. Use of the cell lines must be in accordance with the NIH Guidelines for Human Stem Cell Research. Overall Component: If human embryonic stem cells are used in any Component, then you must answer "Yes." Specific stem cell line cannot be referenced at this time. One from the registry will be used. If you will use hESC but a specific line from the NIH hESC Registry cannot be chosen at the time of application submission, check this box. If you cannot specify which cell lines will be used at the time of application submission, specific cell line information will be required as Just-in-Time information prior to award. If you cannot choose an appropriate cell line from the registry at this time, provide a justification in the G.400 - PHS 398 Research Plan Form, Research Strategy attachment. If you cannot choose an appropriate cell line from the registry at this time, provide a justification in the G.410 - PHS 398 Career Development Award Supplemental Form, Research Strategy attachment. When individual project hESC line information is requested as Just-in-time (JIT), the NIH will require information regarding project title, mentor, and specific cell line(s) from the registry (NIH hESC Registry) for each trainee utilizing human embryonic stem cells. Trainees may not participate in hESC related research until this information has been provided. Overall and Other Components: If you cannot choose an appropriate cell line from the registry at this time, provide a justification in the G.400 - PHS 398 Research Plan Form, Research Strategy attachment. List the 4-digit registration number of the specific cell line(s) from the NIH hESC Registry (e.g. 0123). Up to 200 lines can be added. Instructions have changed so that stem cell information is no longer collected at the Overall Component in multi-project applications. Overall Component: Skip the "Cell Line(s)" field, as any information provided here will be discarded. Instead of cell line information being provided in the Overall Component, a system-generated summary of all cell line information that you provide in Other Components will be included in the summaries section of the assembled application image. Other Components: Provide any cell line information relevant to the work being done in that component. Complete the "Inventions and Patents" section only if you are submitting a renewal application or a resubmission of a renewal application. If no inventions were conceived or reduced to practice during the course of work under this project, check "No" and skip the remainder of the "Inventions and Patents" section. If any inventions were conceived or first actually reduced to practice during the previous period of support, check "Yes." NIH recipient organizations must promptly report inventions to the Division of Extramural Inventions and Technology Resources (DEITR) Branch of the Office of Policy for Extramural Research Administration (OPERA), OER, NIH, 6705 Rockledge Drive, Bethesda, MD 20892-2750, (301) 435-1986. You must report inventions in compliance with regulations at 37 CFR 401.14, which are described at Interagency Edison (iEdison). The grantee is required to submit reports electronically using iEdison. See the NIH Guide Notice on the Requirement to Submit Invention Disclosures, Related Reports and Documents. Skip the "5. Inventions and Patents" section, as it is not applicable. If you answered "Yes" to the "Inventions and Patents" question, indicate whether this information has been reported previously to the NIH or PHS agency or to the applicant organization official responsible for patent matters. Check this box if your application reflects a change in project director/principal investigator (PD/PI) from that indicated on your previous application or award. Note that this box not applicable to a new application, nor is a change in PD/PI permitted for revision applications. For a multiple PD/PI application, check this box if this application represents a change in the contact PI. If you check the box, fill in the rest of the "Change of PD/PI" section with the information for the former PD/PI according to the instructions below. Skip the "Change of Project Director/Principal Investigator" section, as changes in PD/PI are not allowed for career development awards. Skip the "Change of Project Director/Principal Investigator" section, as changes in PD/PI are not allowed for fellowship awards. Enter or select the prefix, if applicable, for the former PD/PI. Enter the first (given) name of the former PD/PI. Enter the middle name of the former PD/PI. Enter the last (family) name of the former PD/PI. Enter or select the suffix, if applicable, for the former PD/PI. Check this box if your application reflects a change in grantee institution from that indicated on your previous application or award. This question is not applicable to new applications. Enter the name of the former institution if this application reflects a change in grantee institution.